We’ve all been there. You’re out to dinner with friends, and someone goes and orders a salad instead of a burger. Suddenly everyone around the table is either feeling guilty for not choosing a healthier option, or feeling deprived for sticking to their diet plan, right? It’s a common misperception that people who say no to things like indulgent food in the name of sticking to a diet are making themselves miserable or are too uptight to break their own rules every once and a while. However, a recent study surveying people on their mood using their smart phones, found that when people had good self-control when choosing between virtues and vices, they were happier. These people experienced less unhappiness because they made fewer choices that benefitted them in the short term, but punished them in the long term, and overall felt like they were acting in line with their life goals. While the person who opts for self-control may initially feel deprived of the instant gratification, long-term, they may feel more content. These findings hint that rather than making you dismal and dreary, self-control makes you happier. Remember that the next time the gorgeous purse outside your budget or the cupcake in the window is calling your name. Saying no to something in the moment might be saying yes to what you want later on. Are you all pumped up after reading Lean In, and vying for that corner office? If you have your eye on a C-suite job (think COO, CEO, or CFO), then you might want to look into working for a company where the current C-suite staff is female or composed of men with children – specifically daughters. Research has found that when high-level executives are fathers to little girls, they are more likely to pave the way for female equality in the work place. They are looking out for their daughter’s futures, and have been shown to be more apt to give women in their company higher salaries and more access to leadership positions, effectively working towards closing the gender gap. These men are looking forward at the opportunities that will be available when their children reach working age, and trying to improve access for women at top levels. WhoSampled all of your favorite songs? Sick of all the music you have on your iPhone, and not sure what to listen to next? There’s an app for that! 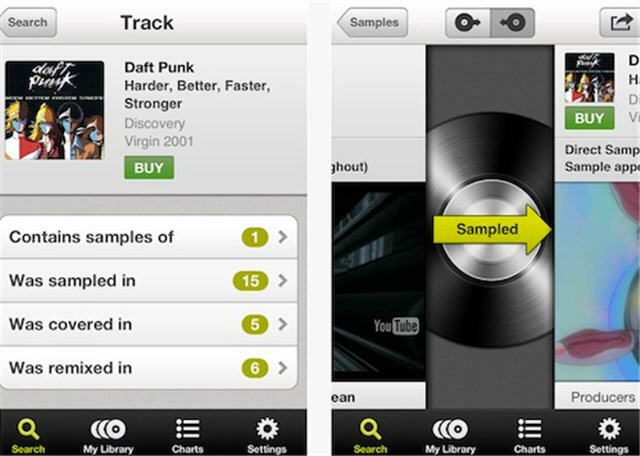 The WhoSampled app will look at the music you have, and suggest tracks to listen to based on what you already like. It gives you access to a library of music through YouTube, Daily Motion and SoundCloud that samples, remixes, or covers the songs in your library. A whole new take on song recommendations all for $2.99. I recently read Lean In by Cheryl Sandberg, and in one chapter she mentions how her generation chose to distance themselves from feminists, even if their beliefs were aligned. Feminist was seen as something of an epithet associated with bra burning and unshaven legs. While Sandberg has long since realized the error of this stereotype, and happily identifies as a feminist, many other women still avoid being associated with the dirty word. Now, the new site Onward and F-word has emerged to advocate for feminism from men and women, to expand the audience who embraces feminism. 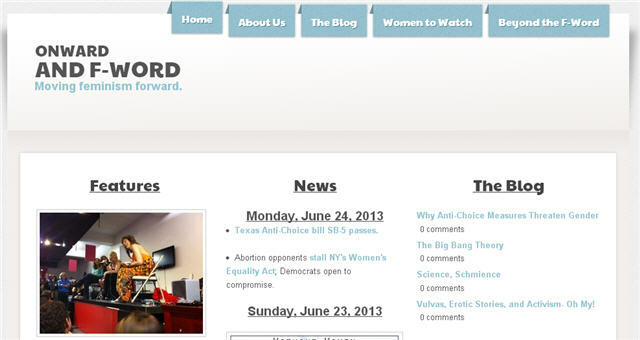 They have blog posts, rising women’s rights activists, and additional resources. Check it out! Like I needed one! Cheese is my favorite food. I love all types in all sorts of ways. And now, I have a great reason not to feel guilty for indulging in the high calorie treat. Researchers found that eating cheese is more effective in preventing cavities than it’s high calcium counterparts milk and yogurt. They attribute this to its ability to raise and maintain higher levels of pH in your mouth that create the neutral 7 level which is ideal for tooth health. However, they qualify that it’s the saliva production that helps, so harder cheese are more effective (think cheddar and parmesan not brie). Additionally, eating it with carbs may cancel out the benefit by lowering the pH of your mouth. There’s a new show that you will probably be ashamed to admit in public in on your DVR. But don’t worry, you’ve got until 2014 to become ok with it. For all of you who grew up watching Boy Meets World on TGIF, get excited. Disney signed a new series into production called Girl Meets World. It will catalogue the life of Cory and Topanga’s daughter Riley as she enters 7th grade (hello awkward phase!). She’s all set to have the best middle school experience ever with her hand sidekick/best friend, Maya, but then Cory (her dad) is her history teacher, and Topanga (her mom) owns a place where everyone hangs out after school. What could be more embarrassing than your parents when you’re in middle school? While we’ve got a while to wait, I know I will be tuning in to watch.